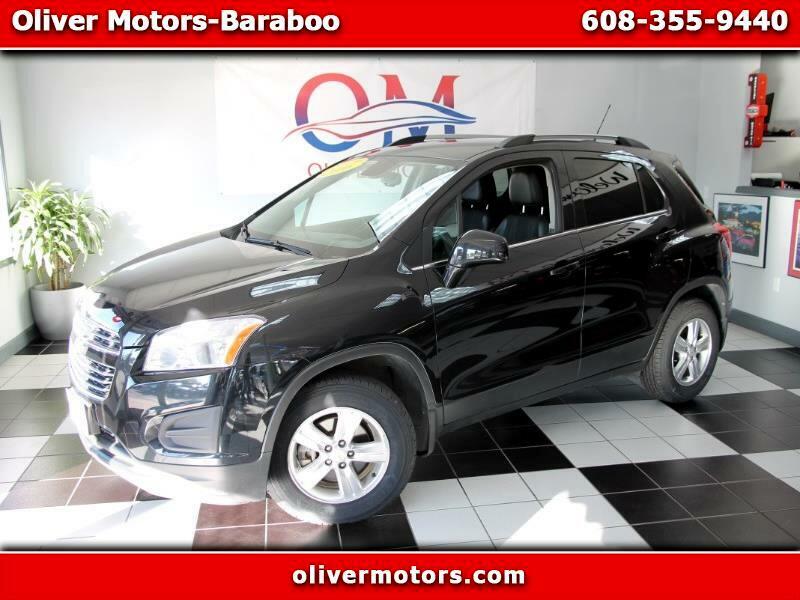 Oliver Motors is EXCITED to offer: 2016 Chevrolet Trax LT AWD with only 59,281 miles! Only one owner since new... leather trimmed interior... clean AutoCheck with no accidents! This is a highly desirable, AWD compact SUV that gets 31 mpg on the highway for less than $15,000! Don't hesitate, or this car will be gone! replaced, and is 100% ready to go! Oliver Motors has multiple locations. This vehicle is located at our Baraboo, WI location. CALL AND SPEAK WITH A TEAM MEMBER TODAY! ****We have a large Lending Network to help EVERY credit situation! ****AutoChecks available on every car! ****Don't forget to ask about other GREAT services we offer! Oliver Motors Baraboo WI. is Sauk County's Premier Pre-Owned Automotive Dealer serving Sauk, Juneau, Columbia, Dane, Richland, Marquette, Adams, Wood, Portage, and Marathon Counties. Compare our competitive SALE prices to NADA Retail and Kelly Blue Book-KBB! Visit Oliver Motors, LLC online at olivermotors.com to see more pictures of this vehicle or call us at 608-355-9440 today to schedule your test drive. This site and all advertising information may be updated without notice whenever new information is obtained or provided. Information may contain mistakes and inaccuracies. Information is provided to the best of our knowledge or the owners of the vehicles knowledge and we make no warranty or representation regarding the accuracy, truth, or reliability of such information. We cannot be responsible for any errors, omissions, or inaccuracies contained in the information provided by third parties. Oliver Motors is not an expert in the construction, engineering, finishes, materials, and component of every single vehicle we have listed for sale. It is the responsibility of the buyer to either inspect the vehicle personally or by third party to ensure satisfaction to the condition and value prior to the purchase.